An antique aquatint engraving by John Hassell. Published in 1819 with later hand colouring. Chicksands Priory in Bedfordshire, the Seat of Sir George Osborn. Bart. An antique line engraving which was drawn and engraved by William Watts. Published January 1st, 1781 with later hand colouring. 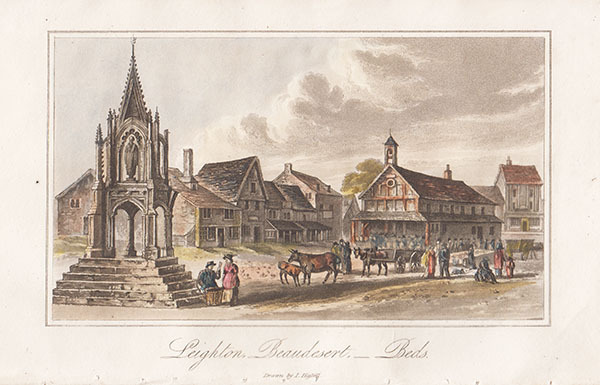 Luton in Bedfordshire, the Seat of the Earl of Bute. An antique line engraving by William Watts after Stewart & Callander. Published April 1st, 1785 with later hand colouring. 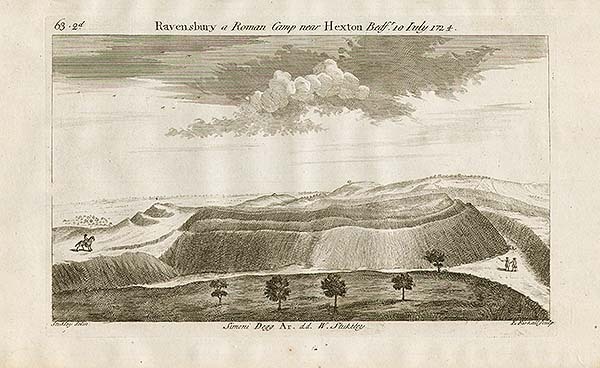 An antique line engraving by E. Kirkall after Stukeley of 'Ravensbury a Roman Camp near Hexton', which appeared in William Stukeley's 'Itinerarium curiosum' (London: 1724). 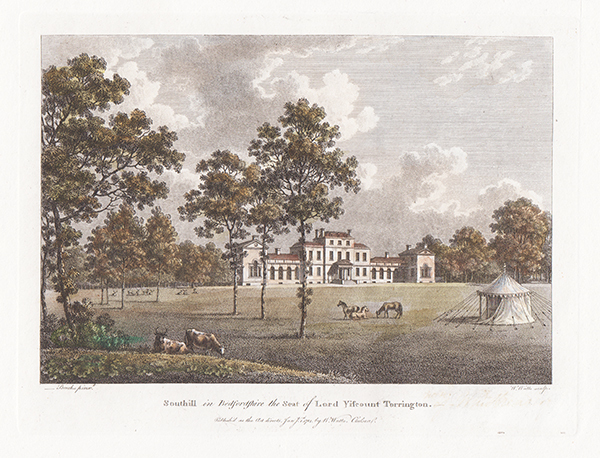 Prospect of Houghton Park House in Bedfordshire. An antique line engraving by Lodge which was published by Alexander Hogg in "The Antiquities of England and Wales Displayed in 1795. Top margin cropped close to printed border. 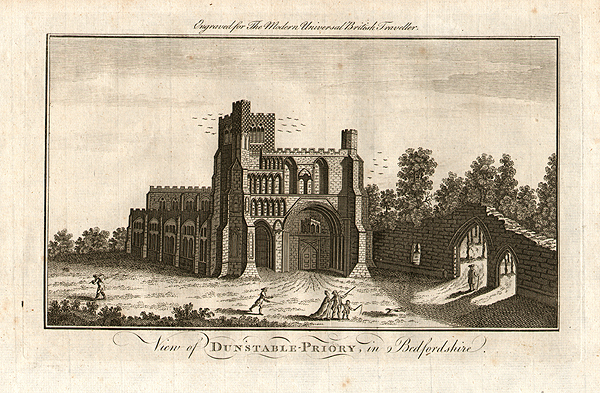 View of Dunstable Priory in Bedfordshire. An original antique chromolithograph published by the Rev. Francis Orpen MORRIS in 1870. An antique line engraving after J. P. Neale.. Published in 1830 with later hand colouring. An antique line engraving by W. Angus after F. Nash. Published in1802 with later hand colouring. An antique line engraving by H.W. Bond after J.P. Neale. Published in 1830 with later hand colouring. An antique line engraving by J. Powell after J. Britton. Published in 1801with later hand colouring. Remains of the Tower at Luton, Bedfordshire. An antique line engraving by M. A. Rooker from an original sketch by Paul Sandby. R.A. Published in 1778 with later hand colouring. 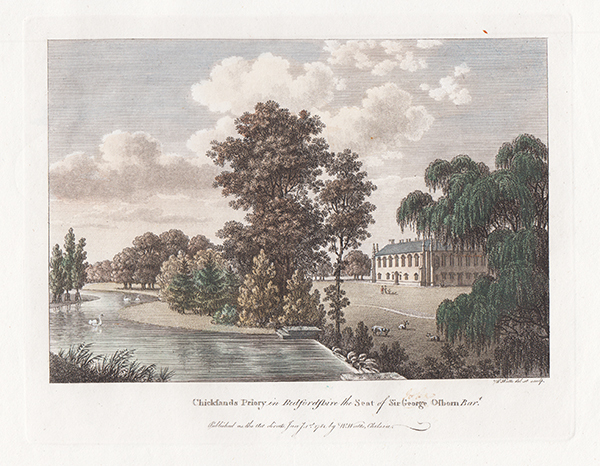 An antique line engraving by Sparrow, published by S. Hooper in 1787 with later hand colouring. The text beneath the image contains some historical facts about the tower. Image approx 15.5cms by 11cms. An antique line engraving. Circa 1830 with later hand colouring. North West View of Dunstable Priory. Britannia Ironworks and Agricultural Manufactory, Bedford. An antique line engraving which was published in the 'Gent. Mag.' in November, 1827. An antique line engraving by F. Stevens after W.H. Pyne. Published in 1815. An antique line engraving by J. Greig after Arnold. Published in 1801 with later hand colouring. An antique line engraving by L. Archer after Haraden. Published in 1818 with later hand colouring. An antique line engraving by J. Roffe after G. Arnold. Published in 1801 with later hand colouring. A View of Westoning Church. An antique line engraving after T. Olive. Circa 1800 with later hand colouring. Very tight margins all round. An antique line engraving by W. Wallis after F.W.L. Stockdale. Published in 1818 with later hand colouring. An antique line engraving by J.C. Varrall after G. Sheppard. Published in 1815 with later hand colouring. The Western Front of The Priory Church, Dunstable. An antique etching by A. Birrel after S. Prout. Published in 1805. 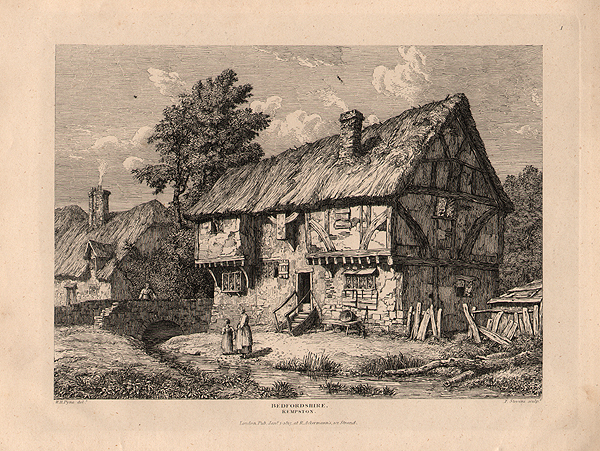 An antique line engraving by William Watts after Brooks. Published January 1st, 1782 with later hand colouring. Evidence of old annotations near the title. North East view of Warden Monastery. 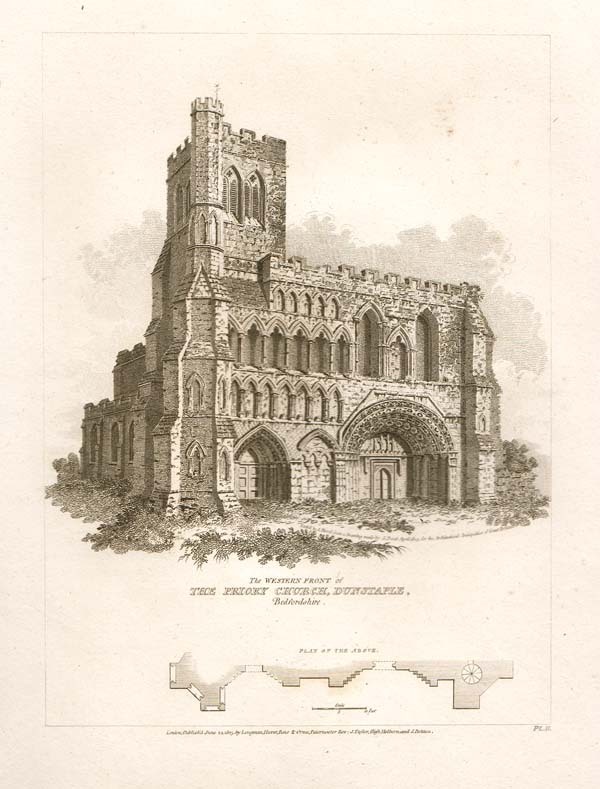 Dunstable Priory, Bedfordshire, 1818. North West View. An antique line engraving drawn and engraved by John Coney. Circa 1820. An antique line engraving by E. Roberts published by J. & F. Harwood. Circa 1850 with later hand colouring. 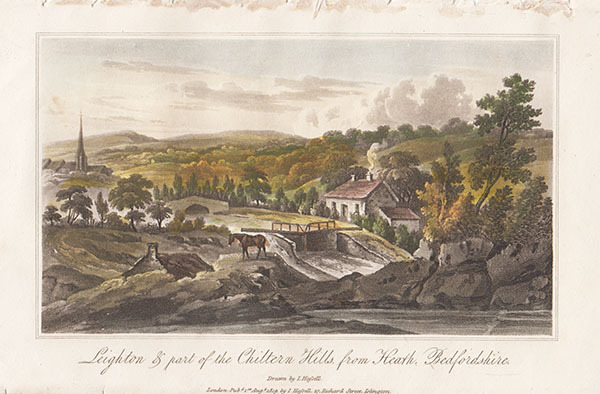 An antique line engraving by T. Higham after J.P. Neal published in 1831 with later hand colouring. Luton Hoo - South East View. An antique line engraving by B. Ralph. Circa 1800 with later hand colouring. Opening of a New Iron Bridge over the Ouse at Bedford. Antique woodcut engravings which were published in 'The Graphic' newspaper in the late 19th century with later hand colouring. Views include Bedford Grammar School. An antique line engraving by D.L. Published by S. Hooper in 1783. An antique line engraving by J. Newton published by S. Hooper in 1787. An early antique line engraving by Sparrow. Published by S. Hooper. Circa 1800. Image approx 16cms by 11 cms. An early antique line engraving after J. Newton. Published by S. Hooper. Circa 1800. North - West View of Donstable - Priory. More Info An antique copper-engraved view from the historic work of the brothers Samuel and Nathaniel Buck, "Views of Ruins of Castles & Abbeys in England," 1726-1742. Samuel and Nathaniel Buck were the most important topographical artists of the 18th century, creating a record of over 500 ancient monuments & towns in England and Wales. This print is dated 1730. An antique copper-engraved view from the historic work of the brothers Samuel and Nathaniel Buck, "Views of Ruins of Castles & Abbeys in England," 1726-1742. Samuel and Nathaniel Buck were the most important topographical artists of the 18th century, creating a record of over 500 ancient monuments & towns in England and Wales. This print is dated 1730.